Last week, it was announced that Linda Hamilton would be returning to the role of Sarah Connor for James Cameron's Terminator 6. However, we can't help but wonder how one goes about asking their ex-wife to come back and save the world from annihilation after a 25 year absence. Recently, both James Cameron and Tim Miller, who will be directing the next installment of the long-running science fiction franchise, sat down with The Hollywood Reporter, where Cameron was asked that exact same question. "It took me a week just to get up the nerve," the director joked. "No, that's not true. Linda and I have a great relationship." In reality, Cameron presented the idea to his ex-wife as an opportunity for her to remind audiences what they've been missing at the movies for the last 25 years. "I called her up, and I said: 'Look, we could rest on our laurels. It’s ours to lose, in a sense. We created this thing several decades ago. But, here’s what can be really cool. You can come back and show everybody how it’s done,'" he said. "Because in my mind, it hasn’t been done a whole lot since the way she did it back in ’91." 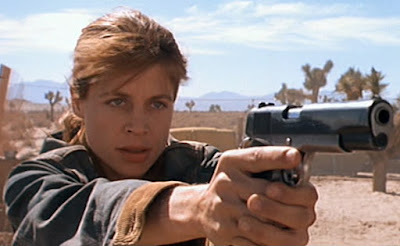 Hamilton played Connor in 1984's The Terminator and 1991's Terminator 2: Judgment Day, however like James Cameron, she would not return for the three subsequent sequels.